Growth Habit: Tall tree growing to 40 metres high. Commonly grown in plantations for softwood and in farm windbreaks. Type of Plant: Evergreen conifer tree. Flowers: Inconspicuous small flowering cones which may take two to three years to mature. Fruit/Seed: Winged paper thin seeds are contained in oval pine cones, 8-14cm long. Dispersal: When mature, the pine cones open up to release the winged seeds. The wind may blow the seed some distance from the parent tree. 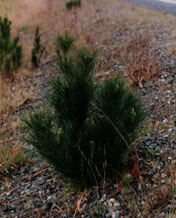 Distribution: This pine has been grown for shelter belts on rural properties and softwood production in Tasmania for many years. It is widely distributed throughout the State. Status: The Radiata Pine is not a declared weed in Tasmania. Wind-blown seed may travel for some distance before coming to rest. It has been known to spread rapidly into bushland areas. Mature trees can produce a large amount of seed. The extent of soil stored seed may not be evident until some type of soil disturbance triggers them to germinate. The distinctive shape, colouring and leaf structure of the tree contrast highly with indigenous vegetation causing a loss of visual integrity in conservation areas. These trees provide little in the way of food or shelter for the native wildlife. Because the leaves or needles that collect under the trees are highly acidic they inhibit the growth of native vegetation. Seed from nearby plantings germinate and grow quickly on the roadside verges and under power lines increasing the need for and cost of maintenance of these areas. Radiata Pine has in the past and is continuing to be planted in commercial plantations in many parts of Tasmania. It is considered to be a valuable forestry tree because of its fast growth rate and the quality of the softwood produced. Similar Plants: There are several native conifers that can be distinguished from the Radiata Pine by the shape of the seed cones, the size of the mature tree, the shape of the leaves or needles and the lack of the characteristic smell. For further information on Radiata Pine contact the Department of Primary Industry, Water and Environment, Tasmania, or Forestry Tasmania. Grubbing (all year). Hand pull seedlings. Herbicide (all year). Spot spray with glyphosate or triclopyr. Cut stump technique is useful on larger plants. Burning (all year). Collect and burn all seed cones. Be aware of fire restrictions. Slashing (all year). Seedlings can be slashed to ground level.